A .zip file is a single compressed file that can hold many other files and folders inside. It is called a “compressed folder” in Windows. How do I create a new .zip file? Open your N:\ drive, or the folder where you want to create the zip file. Click on File and select New -> Compressed (zipped) Folder. A new .zip file is created, called “New Compressed (zipped) Folder.zip” It will probably have an icon that looks like a folder with a strap around it. You can rename this by right clicking the file and choosing Rename. How do I add files to a .zip file? You can treat the .zip file like any other folder and copy or move files into it via cut/copy and paste, or dragging and dropping. You cannot copy and paste from a .zip file directly into the same, or another .zip file. You have to extact the file, then add it to the new .zip file. How do I extract contents of a .zip file? You can double-click the .zip file and Windows will open it like a regular folder. When you double-click files in the .zip file, they will be extracted to a temporary directory and opened with the appropriate program. If you try to run compressed programs this way, they may not work correctly. For programs, you should extract all files to an uncompressed directory before executing the uncompressed program. If you want to extract a single file, simply copy it out of the .zip file using cut/copy and paste or dragging and dropping, just as you would with an ordinary file or folder. If you want to extract all the files in a .zip file, right click on the zip file and choose Extract All. This will open a wizard to guide you through the next steps. How do I add a password to a .zip file? You must first double click the .zip file to open it. 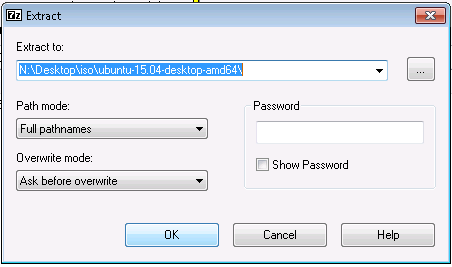 Then right click in a blank area and choose Add a Password. Now that CD and DVD drives aren’t as common, it can be handy to unzip disk images (.iso files) onto usb drives, instead of burning them to disc. This is often done for installation media. First: Open 7-Zip. It can be located by opening the start menu, and searching for 7-Zip. Second: navigate in 7-Zip to the image (.iso) you wish to unzip. Then press extract. Third: you can choose to extract to a different folder or location. By default 7-Zip will extract to a new folder in the current directory, named the same as the iso you are unzipping. Click ok to start extracting.